Windshield damage is quite common and is a natural driving hazard. Road debris often strikes the windshield causing noticeable damage. If the damage to the glass is not too severe, or is not directly in the driver’s line of sight, most “rock chips” can easily be repaired by a professional windshield repair technician. If the cracking process is not stopped, it will quickly spread to cover a large area of the windshield resulting in a complete windshield replacement. Windshield repair is a much cheaper and less time consuming alternative to complete windshield replacement. In fact, most insurance companies will waive the deductible for a windshield repair virtually costing the policy holder nothing out of pocket. Time, however, is very important. Changes in temperature and driving conditions can quickly turn a little windshield repair into a major windshield replacement. You know that little annoying chip in your windshield that you have putting off fixing until tomorrow? Wait no longer. The windshield repair experts at Precision Glass can quickly evaluate the windshield damage and determine the best course of action for your windshield and your budget. Call Precision Glass today! Windshield repair is very convenient and preserves the integrity of the original factory seal - your auto glass is never removed! Windshield repair saves money - the price to repair is a fraction of the cost of replacement. 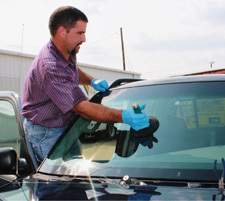 Windshield repair saves time - it takes about 15-30 minutes compared to a possible 2-hour time frame for replacement.